When renovating your kitchen, the first step is to plan a layout that makes the best use of the available space. However, planning a kitchen layout with new cabinetry is a fairly challenging task because you need to consider several factors. You also need to calculate your budget carefully as the costs include not only the new cabinets but also the installation and labour costs. In this blog post, we’ll guide you on how to modify the kitchen layout to fit additional storage and new appliances. Whether you’re planning to renovate the entire kitchen or simply reorganize it, take advantage of every inch of your kitchen. Based on how much storage and cabinetry you need, aim for a design that doesn’t make your kitchen look smaller. The best way to decide the function of your new kitchen cabinetry is to determine exactly where you need certain things within arm’s reach. Decide which cabinet should hold wine and which should hold dishes and crockery, and where you want to keep your appliances, plumbing fixtures, etc. Place everyday items such as silverware drawers near the sink for easy cleanup; and spices, oil, vinegar, pots and pans near the cooktop for easier cooking. You can keep items that are not used frequently farther from the main workstation. If you want to make your kitchen look more spacious, then one of the best ways to do it is to maximize your storage. More storage space means less countertop clutter. However, consider forgoing upper cabinets as they tend to make the space appear smaller and congested, especially in small kitchens. The alternative solution is to devote an entire kitchen wall to full-height storage instead of installing upper cabinets throughout. There are many layout design options but the suitability depends on the area of your kitchen. A larger space allows for more options. Below we’ve listed some of the most popular kitchen layouts. Galley Layout: This design is ideal for a narrow kitchen where the cabinets run all through the opposing walls. But the design limits floor space. L-Shaped Layout: This layout design accommodates cabinets on two adjoining walls. It provides extensive space for storage and flooring. It can also include a dining area if your kitchen is large. U-Shaped Layout: This layout design accommodates cabinets all over three walls, providing maximum storage and capacity for appliances. But it limits space for standing and may need you to place your refrigerator near the door. If you have a large kitchen, a part of the U-shaped layout can also be utilized as a breakfast bar. Island Layout: This design works well for both small and large kitchens where the appliances are mostly installed in the kitchen island. Consider keeping your kitchen countertop, kitchen cabinetry, and island in a linear alignment when designing a kitchen layout. This ensures that there’s less visual interruption making your kitchen look longer. Once you’ve decided your kitchen layout depending on the style you want to create, contact a reputed kitchen contractor that’s highly experienced in kitchen renovations and cabinetry. They’ll take accurate measurements and produce a suitable design for your kitchen. There are several choices available in terms of materials, finishes, accessories, configurations, and hardware. Every home is different and everyone uses their kitchen differently. But the common desire is that the kitchen has accessible features and meets the needs of life. Make sure that the counter and cabinet heights are accessible, the doorways are wide enough to accommodate wheelchairs, and there’s enough room to move and stand. 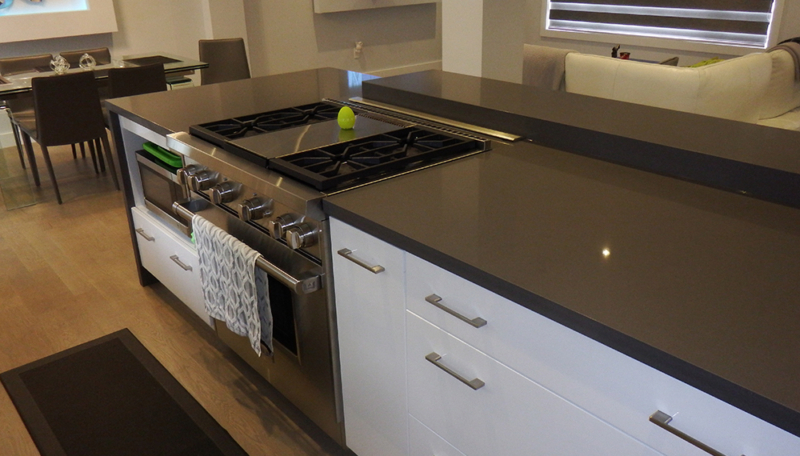 If you want a modern makeover for your kitchen, contact Euroline Kitchens Ltd. We’ve been serving Mississauga and the GTA over a decade specializing in custom cabinets, wall units, functional closets, portable bars, and all your kitchen designing needs. For a free quote, write to us today!